Kitten by name and Kitten by nature, the elegant kitten heel and long toe makes a stunning classic design. 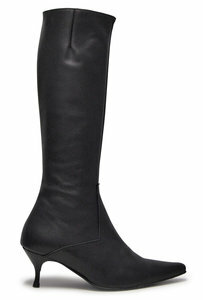 Perfect in black leather but also available in our sophisticated navy blue or dark brown leathers. Kitten is beautifully finished with a gorgeous leather lining, a full length inside zip and a concealed stretch panel for extra comfort at the top of the boot. Elegant and comfortable with a five cm heel and a pointed toe. Sizes 40 and 41 have six cm heels. A great all round boot. Kitten is still comfortable across the toes despite the elegant shaping. The pointed toe means you may be able to take a size smaller than your usual size, any questions please bespoke . The ankle of Kitten is quite tailored so for those of you with calves 40 cms or over the ankle should be measured approx 7 cms above the ankle bone to ensure a comfortable fit.